This is a drawing of a lion. The artwork was created with pens, markers and a white gel pen. The lion was initially sketched with a thin black pen and transparent grey markers. The grey markers were used for subtle shading and blocking in darker colored areas. Yellow, red and orange markers were then used to fill in highlights, midtones and shadows with color. A white gel pen was then used to add highlights and create wisps of lion hair. The lion’s longing gaze upwards highlights the gentle side of the common cultural depiction of lions as being strong, yet gentle, “kings of the jungle”. This is a drawing of a puppy running. 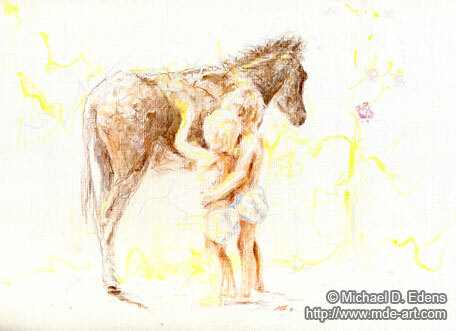 The sketch was drawn with pen and watercolor on white paper. The puppy is running toward the viewer with a playful bounce, slightly nervous gaze and purposeful stride. The subtle application of color and pen lines helps to create a light feeling to the drawing, and emphasizes the delicate joy and good-natured fun expressed by a playful puppy. This is a painting of a lioness created in 2013. The painting was created with a mix of dry and wet mediums including pencils, oil pastels, watercolors, acrylics, and markers. The aftermath of a hunt is expressed via intense color, line movement and expression. The stark white background helps keeps focus on the intensity of the animal. This is an artwork consisting of two separate drawings of two different dogs. The dog on the left is a Jack Russell Terrier and the dog on the right is a Great Dane. 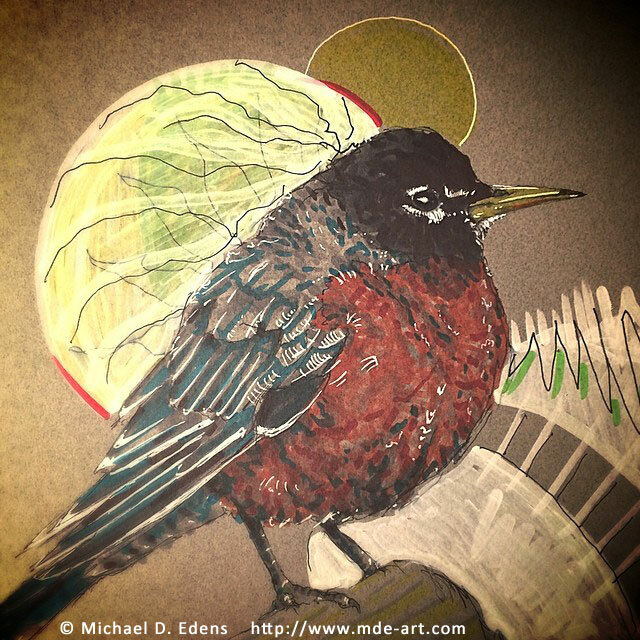 Each drawing was created with pens, markers, watercolors, oil pastels, colored pencils and acrylic paint. Each dog drawing is approximately 12″x12″. A frantic array of line work creates the foundation of each dog with gradient blocks of shifting color and value filling in the space. Dark black shadows help hold structure and provide focus amidst the frenetic patterns. This is a drawing of an Appenzeller Puppy Dog. The dog drawing is approximately 14″x14″ and was created with a combination of mediums including pens, markers, watercolors, paint pens, oil pastels and colored pencils. 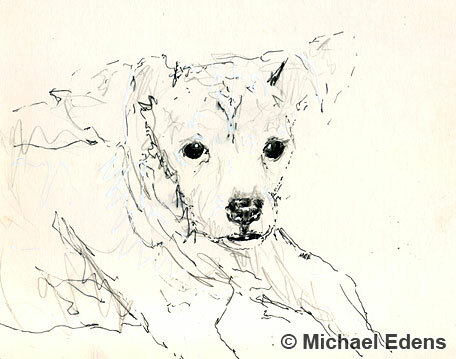 The puppy dog was originally drawn with pen. 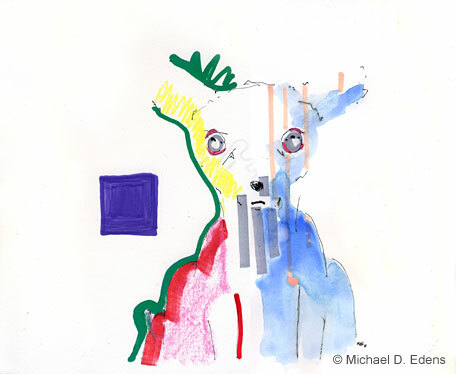 Subsequent layers of mixed media techniques and playful color combinations create a uniquely styled dog drawing. A time-lapse video of the drawing and painting process can be viewed below. If you enjoy the video, please subscribe to the MDE Art YouTube Channel. RAWRSOME! 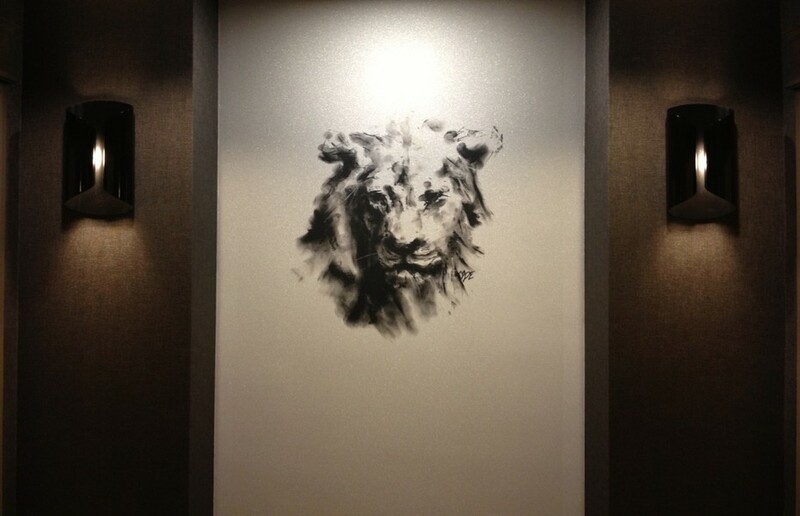 I’m pleased to announce that my charcoal “Lion” drawing is a permanent 5’x5′ textured, shimmering wall installation in all 23 elevator lobbies of the InterContinental Chicago Magnificent Mile. Forbes.com did a full write-up about the artwork as part of the hotel’s 2013 renovation, however, the article’s author, Andrew Bender, didn’t mention my name as the artist of the artwork. I contacted Andrew requesting a reference by name, but have not received a reply. 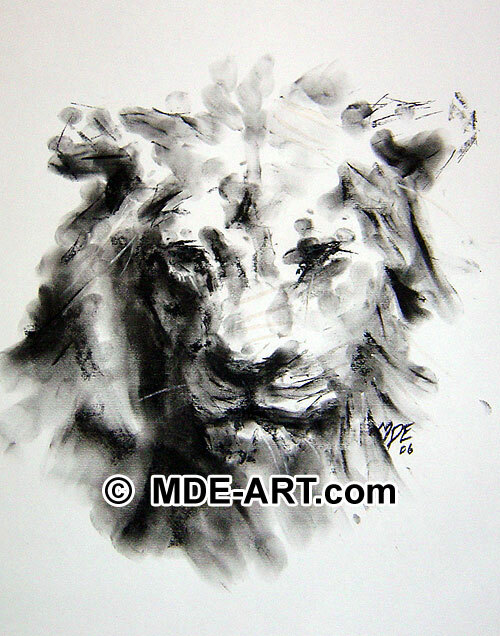 High quality canvas wrap or giclée prints of the Lion drawing are available through my ImageKind account. The completed elevator lobby installation featuring my artwork. It’s an honor for me, and I think it looks neat in-person. The whole thing shimmers. Tom Brassell, Digitally Imaged Surfaces Consultant, created a photographic blog post about creating the wall installation from the original lion artwork. 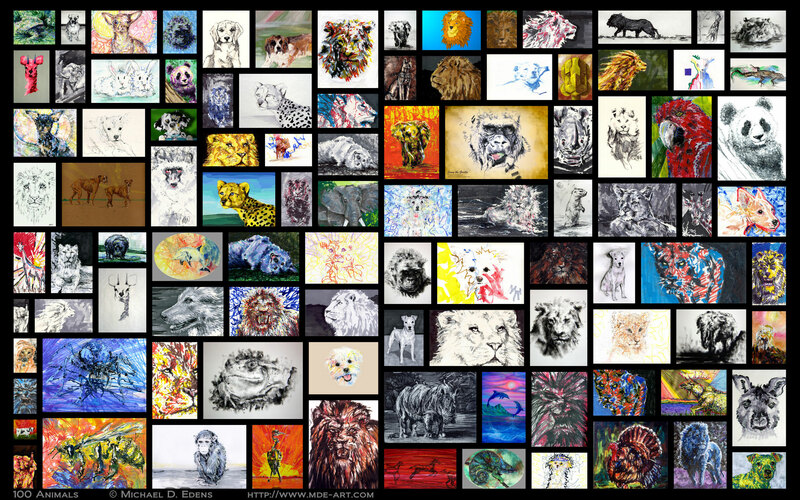 Photo collage of 100 Animals; artwork by Michael D. Edens over a period of about 15 years. The artworks include a variety of animals including pets, wildlife, birds, fish, mammals, reptiles and more. 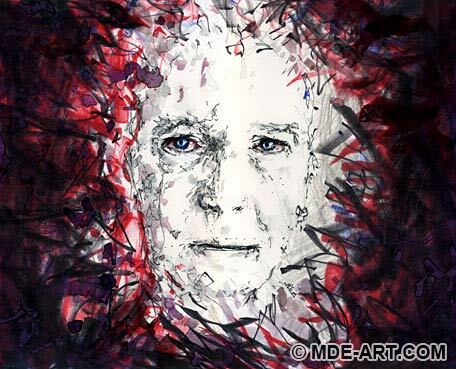 The drawings, paintings and mixed media artworks were created in a variety of styles and wet & dry mediums including pens, ink, colored pencils, markers, acrylics, gouache, watercolors, oils, charcoal, crayons, pastels, chalk and digital imaging. The drawings and paintings range in size from a few centimeters to several meters. Styles include abstract, realism, impressionism, expressionism, and a broad blend of of expressive techniques. This is a drawing of a two dogs, specifically their breed is called a Boxer. The 7″x11″ dog artwork was created in 2011 with pens, watercolors, oil pastels, and colored pencils. 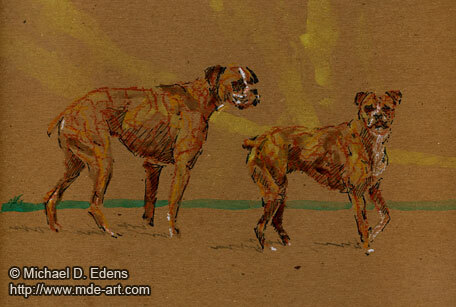 The two dogs were initially sketched with pens, followed by oil pastels for white and brown hair color. Watercolors were used for subtle gradients and background elements. Like most dogs, the male and female Boxers enjoy running and playing together outside in the sun. This is a drawing of a sleeping dog, specifically the breed is called a Jack Russell Terrier. 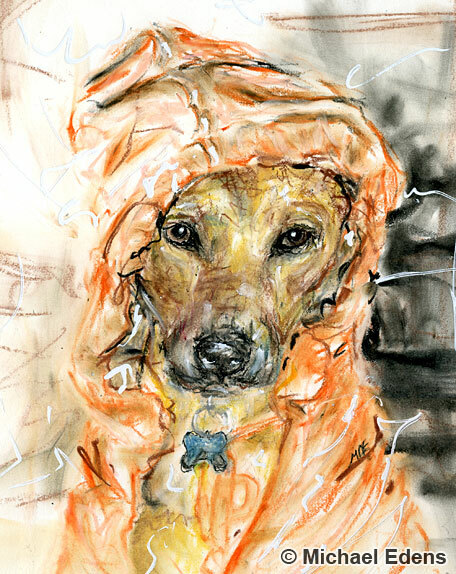 The 9″x12″ dog drawing was created in 2011 with oil pastels. 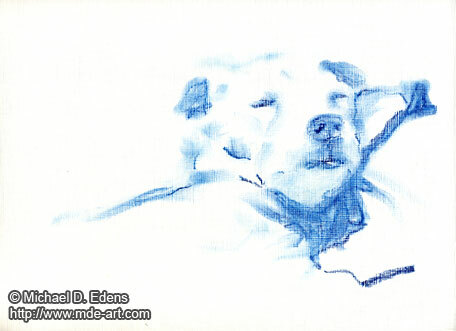 The drawing started out as a quick sketch of the Jack Russell Terrier sleeping on a blanket. The lines were then blended into the canvas paper to give the dog dimension and create shadows. This is a drawing of three bears. The 9″x12″ bear artwork was drawn in 2011 with colored pencils, paint pens, oil pastels, pens, and acrylics. 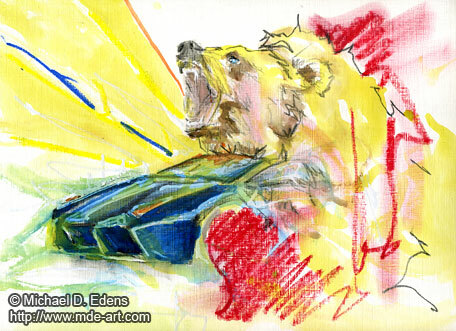 The initial sketch of the bears was created with colored pencils and pen. 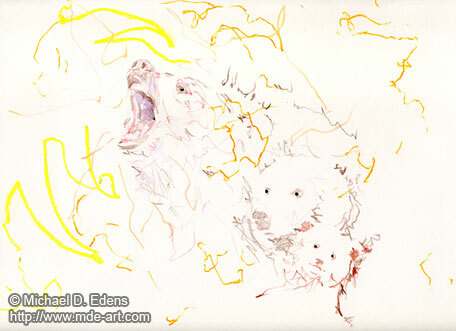 Additional expressive lines, shapes, colors were added with other mediums in order to help enhance the protective ferocity of the adult male bear’s roar, the uneasiness of the female bear, and the fear in the baby bear cub. This is a drawing of a puppy. The 9″x12″ puppy artwork was created in 2011 with a mix of colored pencils, pens, oil pastels, acrylics, gouache, and watercolors. 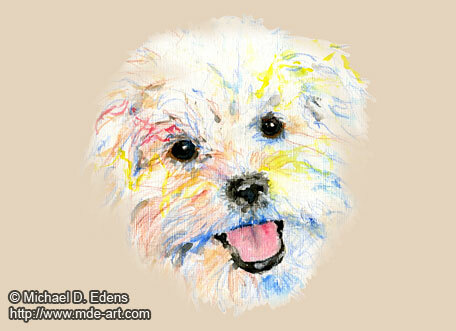 The colorful puppy’s face was sketched with colored pencils and pens, followed by alternating oil pastels and watercolors for the eyes, nose, mouth, and portions of the hair. 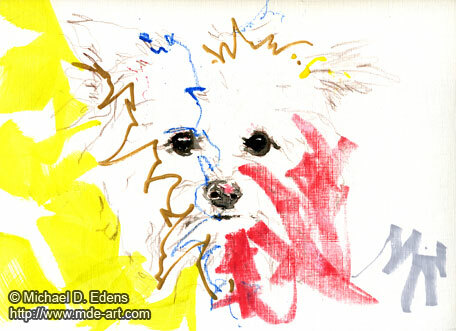 This is a second drawing of a puppy, sized 9″x12″, drawn in an abstract expressionist style. The puppy was drawn with colored pencils, paint pens, markers, pens, oil pastels, and watercolors. 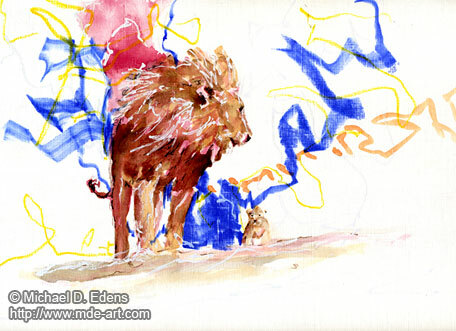 “Lions” is a 9″x12″ drawing of a big lion and a little lion cub. The artwork was created with pens, markers, oil pastels, watercolors, and acrylic paint. The following artworks are similar drawings and paintings of a burro with two children reaching for its fur in the sunlight. The first is a 9″x12″ painting/drawing created with watercolors, oil pastels, colored pencils, pens, markers, and acrylic paint. 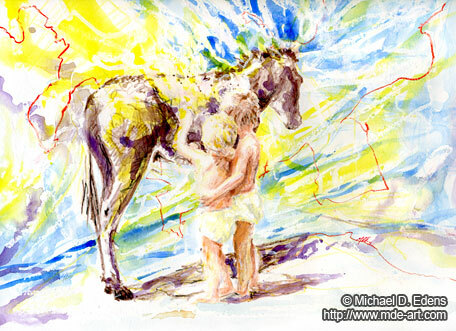 The painting is full of color as nature’s energy surrounds the two children and the burro, bathed in light, sharing a moment together of innate curiosity and companionship. The second artwork is a 9″x12″ drawing created with colored pencils. The drawing focuses primarily on the relationship between four subjects; the burro, two children, and bright warm light emanating throughout. 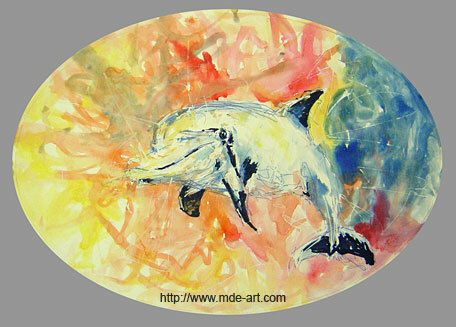 This is a 15″x21″ drawing and painting of a dolphin, drawn and painted with pens, paint pens, and watercolors on matte board. The drawing started with a quick blue pen sketch, followed by deep blue paint pen. White paint pen on the white of the paper was next, which creates interesting patterns under the watercolors applied last. This is an abstract drawing / painting of a dog entitled “I didn’t want purple on the dog so I put it in a square to the left”. The artwork is approximately 11″x13″, drawn and painted with pens, oil pastels, paint pens, and watercolors on card stock paper. This is an 10″ x 8″ drawing of a dog in a sweater, created with oil pastels, pens, colored pencils, and a little white paint pen. The friendly pup’s name is Johnny Cash, and he’s one of the first subjects in a new series of animal portrait art drawings. The drawing style begins with light colored pencil for the initial sketch, black pen for deep dark detailed areas, oil pastels on top, and a touch of white for highlights. Johnny’s an awesome dog with a great sense of humor. Don’t let his day naps fool you; he loves to run laps around the house. And when he gets to go to the dog park, look out! He runs non-stop! Johnny enjoys it so much that he’s fully aware of when his owner is ready to leave, and he loves a good game of chase before heading home. Special thanks to his owner for providing a fantastic reference photo! 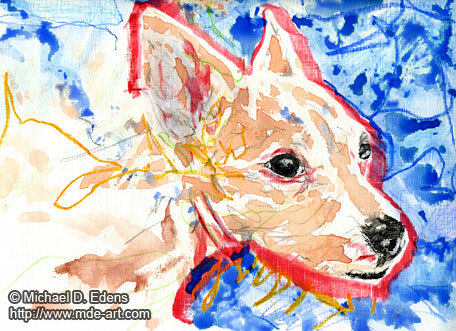 This is an 8″ x 10″ quick sketch of my dog Spot, drawn with pen, colored pencil, and paint pen. He’s a pure white five year old Jack Russell Terrier who developed rapid onset cataracts this past week. The vet says his vision has deteriorated to the equivalent of looking through a cloudy shower door. And we learned the hard way yesterday that “fetch” will have to be put on temporary hold. The little guy has a lot of energy, and he’s still young, so I’m starting to save up for surgery. The quality of his life is important to me. Here is one more drawing of Spot; a watercolor painting of the dog from 2005. 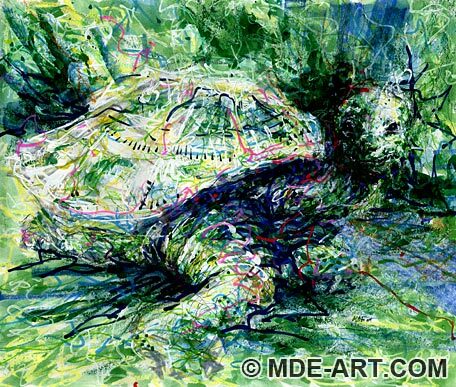 This is an 11″x13″ drawing of a turtle, drawn and painted with markers, pens, paint pens, oil pastels, watercolors, and acrylic paint. 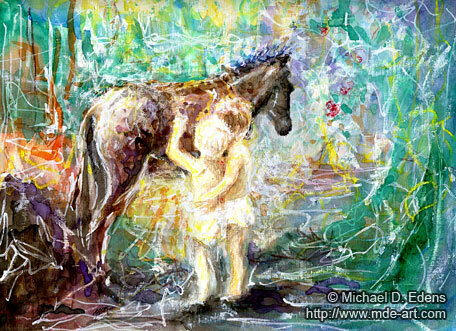 The style is loose and impressionistic with an unconventional color palette and mixture of mediums. Shades of blue and green permeate the shadows around the turtle and in the background. This creates contrast between elements like the white highlights on the turtle shell, face, and leg, pushing them forward in the composition. And the variety of mediums in the artwork creates a unique surface texture befitting the turtle and surrounding foliage. The time lapse video shows the process of drawing and painting the turtle, and how multiple variations and layers all exist within the same artwork. This is a 9″x12″ abstract drawing of a bee, created with markers, paint pens, colored pencils, pens, and watercolor mediums. The vibrant, warm color palette and loose style adds a frantic feeling to the artwork. Quick strokes of color and medium are blurred around the paper with spatters of watercolor to create a sense of movement and buzzing. Silver and gold paint is also used to add a shimmering effect to the bee. 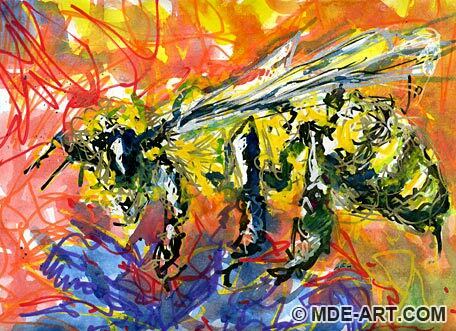 The accompanying video shows how I draw and paint the abstract bee in a time lapse format. 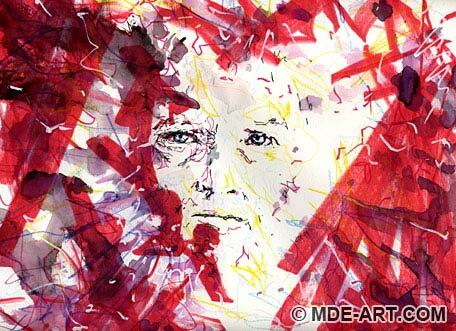 The composition was initially sketched with light yellow, followed by rich oranges, reds, and silver and gold paint pens. Lush mixes of watercolors and white highlights were also applied to the entire artwork.